Recently, the world came face to face with a ghastly terror attack in Christchurch, New Zealand. A white supremacist brutally shot the Muslim citizens in two different mosques of the city. While the entire world condemned and stood as one against this gruesome act of terrorism, the New Zealand Prime Minister Jacinda Ardern took a step forward and went ahead to console the families of victims individually. While addressing people at Hagley Park, adjacent to the Al Noor Mosque, in Christchurch; she declared that instead of the name of the attacker, the names of the victims would be mentioned. A “sympathetic”, “praiseworthy” and “Naya” Pakistan came forward to commend her actions. 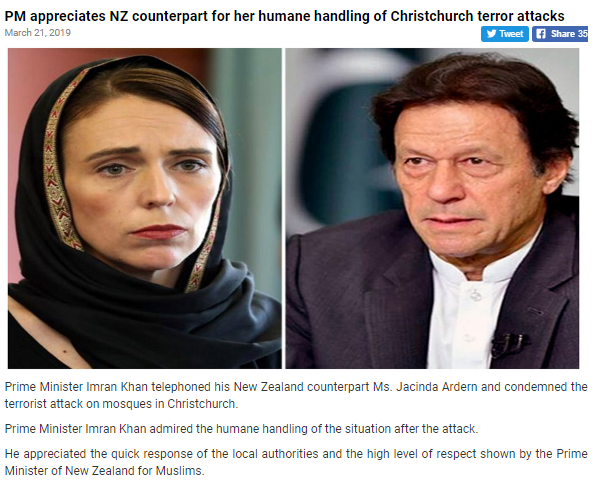 According to a Pakistani newspaper, Prime Minister Imran Khan called up Jacinda Arden personally to convey his appreciation on how humanely she handled the crisis. In fact, Shah Mehmood Qureshi, the Foreign Minister of Pakistan, like a good servant of his military, criticized New Delhi for not standing up in condemnation of the attack and use the words ‘Muslim’ or ‘mosque’ while addressing it. My only question to Imran Khan, S M Qureshi or any Pakistani official is, when has Pakistan ever stood up for Uighurs Muslims being brutally persecuted in Xinjiang, China? Where China is concerned, “Naya” Pakistan is not a pinch better than the old, extremist and hypocrite Pakistan. After all, China might be abusing millions of Uighur Muslims at home but is protecting the leader of the terrorist group JeM, Masood Azhar, the precious gem of Pakistan, from being listed as “global terrorist” at the UN. Even the Secretary of the United States, Department of State, Mike Pompeo, could not bring Imran Khan to realize the condition of his Muslim brothers in Xinjiang. To add to the hypocrisy, Imran Khan has made a mockery of himself by saying, “Frankly, I don’t know much about that”, when asked his opinion about the “re-education” camps for Uighur Muslims in Xinjiang. Imran Khan condemns the attack by a white supremacist but fails to even address the plight of Uighurs in China. Sounds like a gullible man. What glaring double standards! In this interview, the ex-Army Chief and ex-President of Pakistan, Pervez Musharraf, acknowledged terrorists like Zakiur Rehman Lakhwi, Hafeez Saeed, etc as his heroes at that time, and yet, Pakistan like the imposter nation it is, denies the existence of terrorists in its premises. No wonder Hazaras (Shia Pashtoons) keep getting blown up in Quetta. Having said that, let us shed more light on Pakistan being a haven and “heaven” for Terrorists. Recently after the tragic Pulwama attack in Jammu and Kashmir, for which terrorist group, JeM, claimed responsibility, The Foreign Minister of Pakistan, Shah Mahmoood Qureshi, mentioned that JeM leader is so unwell that he is unable to leave his home in Pakistan. He implied that Pakistan not only gives shelter to terrorists but also aids the ailing ones. For instance, Here is a list of “some” of the ‘most wanted’ terrorists killed on Pakistan soil. It must be noted that these fanatics were killed or arrested by US not Pakistan, so we know it is not fabricated. Osama bin Laden – Al Qaeda leader – killed on May 02, 2011 in Abbottabad by a special unit raid (near Pak army training HQ), Pakistan. Adam Gadahn – Al Qaeda – killed on Jan 19, 2015 in a drone strike in Waziristan, Pakistan. Hakimullah Mehsud – TTP – killed on Nov 1, 2013 in a drone strike in Waziristan, Pakistan. Abu Yahya al Libi – AL Qaeda leader – killed on Jan 12, 2012 in a drone strike in North Waziristan. Sheik Said Masri – Al Qaeda leader – killed on May 21, 2010 in FATA, Pakistan in a drone strike. Hus­sein Ye­meni – Al Qaeda leader – killed on March 08, 2010, in a drone strike in Miram Shah, Pakistan. Baitul­lah Mah­sud – TTP – killed on August 05, 2009 in a drone strike in Miram Shah, Pakistan. When Pakistani PM claims that Pakistan is not a safe haven for terrorists, he is probably fooling himself. Pakistan could be blacklisted by the Financial Action Task Force (FATF) due to “lobbying by India”- so said Foreign Minister Shah Mahmood Qureshi. In June 2018, FATF had put Pakistan on the grey list and asked Pakistan to reassess the operation of banned terrorist outfits in the country, of which they deny any existence. Instead of listening to FATF’s warning, the intelligent Foreign Minister of Pakistan asked his office to calculate the loss that they would face as India is lobbying for Pakistan to be blacklisted by FATF, which by the way will be USD 10 Billion annually. It is almost as if the Pakistan Army and Imran sneeze because India has done something and not because they are sick. HYPOCRITES! Firstly, while lying and denying, Foreign Minister forgot that FATF evaluates countries under the radar of money laundering and terrorism financing by a country, not by lobbying. Secondly and most importantly, Pakistan came under the gunpoint of FATF as proposed by the United States, France, United Kingdom and Germany, and NOT by India.